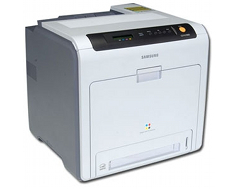 The Samsung CLP-610nd is a network color laser printer that is designed to handle the demands of small and medium business applications in a compact package that guarantees both consistency and durability. With fast first page out times, a large duty cycle and sharp, finely detailed resolution, this color laser printer can handle a wide variety of text and graphics jobs, whether it be one page at a time or thousands. 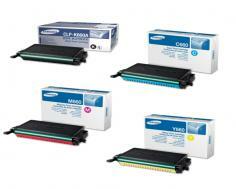 The Samsung CLP-610nd can print at speeds up to 21 pages per minute in both black and white and color. First page out time is a respectable 20 seconds from a ready state, reducing wait times for people printing single page or multiple page documents. A maximum print resolution of up to 2,400 x 600 dots per inch ensures top quality printing with results that yield sharp and crisp text and vibrant, detailed color graphics and images. The small or medium business can easily print professional looking reports, invoices, memos and other critical business documents needed to make a great impression. 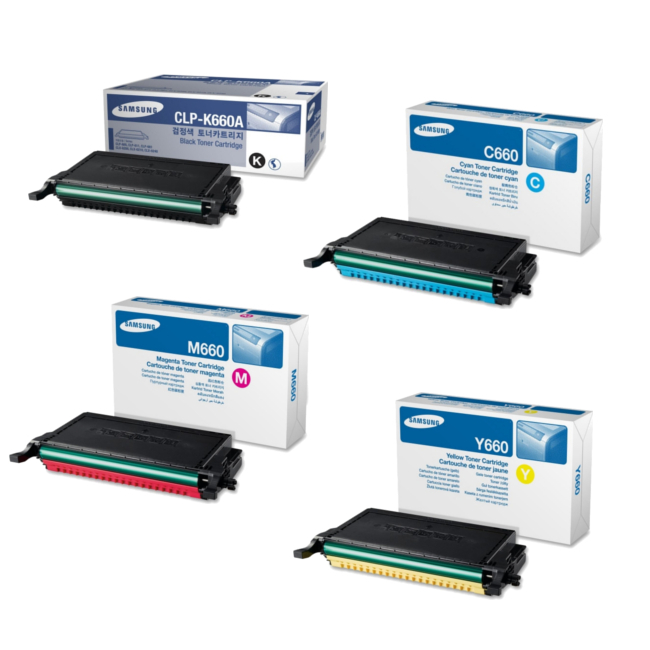 A Samsung 360 MHz processor provides enough multitasking abilities to effortlessly handle print queues and network sharing. 128 MB of page RAM comes standard with this model, with the option to upgrade to a maximum of 384 MB with the purchase of a 128 or 256 MB module that can be placed in one available expansion slot. The duty cycle for this machine is rated at a maximum of 65,000 pages per month, providing plenty of reliable operation for low or medium volume jobs, and allowing for unexpected increases in output volume without having to be concerned with premature wear and tear or reduction in quality. The most modern PostScript printing language comes with this model, which enables compatibility with a vast range of software and applications. Special color profiling technology gives color prints an extra sharp and vivid look. Standard connectivity options include built in USB 2.0 and fast Ethernet interfaces, for direct connection to a PC or connection to a network for use as a shared office resource. A removable cassette style paper tray with a 250 sheet capacity comes standard with this model, with the option to add a 500 sheet cassette which together can accommodate an total of 750 sheets of paper. Paper output capacity is 200 sheets, which is slightly higher than some comparable models, allowing for bigger print jobs to be processed without a user having to be constantly present. Media types that are supported include plain paper, envelopes, labels and card stock. Paper input cassettes can handle a paper weight range of 16 to 28 pounds for feeding through the mechanism and 16 to 43 pounds when fed directly into the straight-through bypass tray. A wide range of operating systems are supported, including Windows, Mac OS X, Linux, NetWare and SunOS, to name a few. For most laser printers manufactured recently, 21 pages per minute is considered slow for black and white printing and average for full color. 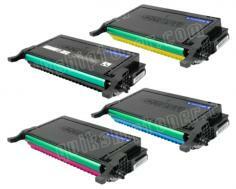 At the lowest quality setting for color printing, to achieve the top rated speed, image quality suffers greatly. This model is not guaranteed to work with Windows 7 operating systems, potentially limiting the functions and features available when connected to a newer computer. Power consumption is higher than most comparable models in both fully operational and sleep mode, causing operating costs to increase. Mac OS X support is limited to TCP/IP network functions, making this model less than an ideal choice for Mac users. Review it: "Samsung CLP-610ND "
The Samsung CLP-610nd comes with a starter toner kit that contains one black toner cartridge with an average yield of 2,500 pages and three color cartridges (cyan, magenta and yellow) with an average yield of 2,000 pages. Replacement cartridges can be purchased with the same capacities or high yield cartridges can be purchased, with an average yield capacity of 5,500 pages for black and 5,000 pages for color. Replacement transfer belts can also be purchased, which have a yield capacity of up to 50,000 pages.